Being one of the trusted firms in the industry, we are highly engaged in providing a unique range of Air Foil Fans. We are dealing in Airfoil Fans. Being a highly effective and fast-moving firm, we are instrumental in providing Square Airfoil Centrifugal Fan. - Specially designed to move high volumes of clean air at low-to-medium static pressures. for supply and exhaust of air, gases, fumes and other industrial process. limit load power characteristic, lowest noise level and efficiency available. design in SISW and DIDW upto 400C temperature application. Airfoil Bladed Centrifugal Fans. These industrial fans with efficient airfoil blades are recommended for all supply air and clean air exhaust applications, as well as variable volume systems. wheel dia. : 12" to 81"
We engaged in manufacturing a wide range of fans airfoil fans. 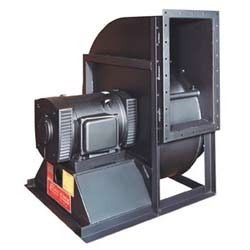 Centrifugal Fan is designed to handle large volumes of relatively clean air at low to moderate pressures in applications such as HVAC, combustion air supply, filtration and drying systems, fume hood and spray booth and other exhaust systems, air pollution control (clean side of dust collectors), and other industrial processes. The vanes of the turbo type fans have been changed in the shape of the airplane wings. This fan proves to have the highest efficiency with the minimal noise among all of the centrifugal blowers.